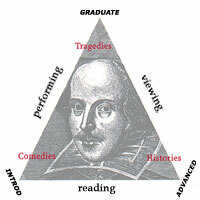 The syllabus for English 431, Advanced Shakespeare, structures activities and assignments around reading, viewing and performing. Final take-home exams in the course ask students to reflect on their experience of all three and the relationships among them. Students read four plays and a selection of sonnets. They also read assigned critical essays on the plays and on the two film productions of each play they view. Quizzes are not used unless deemed necessary. Students present ten minute oral reports on textual passages, on the critical readings, on a scene in a film production and on film criticism as basis for class discussion. The 154 sonnets are divided into groups of 8. Each student selects one of that group and reports on it. Individual students are assigned readings appropriate to their level of ability. The class includes in-class live performances of one or more scenes and conclude with a film production component. Teams of students rehearse and videotape a selection of scenes, either from one or several plays. The videotaped collection of scenes is presented to the public at the end of the quarter. Students find locations that stimulate their imaginations, avoid the need for sets, and offset limitations in acting and production skills. A 1999 class took a three day field trip to my University's remote Swanton ranch facility, where they filmed A Midsummernights Dream 3.2 in the middle of a redwood forest, King Lear 4.6 on a cliff above the ocean, and The Winters Tale 3.3 on a stormy seashore. A 1991 class produced a composite version of The Winter's Tale--five crews doing five scenes at different locations and combining them all together into a single video entitled "The Triumph of Time."